Arditi (from the Italian verb ardire, lit. "to dare", and translates as "The Daring [Ones]") was the name adopted by Royal Italian Army elite special force of World War I. They were the first modern shock troops and have been defined "the most feared corps by opposing armies". Members of the Arditi corps, 1918, wielding daggers. 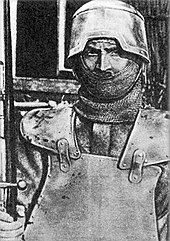 Soldier of the "Companies of death" wearing Farina helmet and body armour. The ardito concept can be traced back to 1914 when every regiment of the Royal Army was ordered to create a group of explorers trained to act behind enemy lines. The first Arditi units were formed and trained in Sdricca di Manzano, in the province of Udine, where the event is still celebrated on the last Sunday in July. The task of Arditi units was not to clear the way for regular infantry to attack enemy lines, but to completely overrun enemy positions. The most daring volunteers were chosen, particularly those who were not bothered by loud incoming artillery fire close by. The men also studied fencing and were masters of hand-to-hand combat. Once ready, they were sent to the front armed with a dagger and hand grenades. Most did not carry rifles or carbines because they would be cumbersome to fire in the confined spaces of a trench. The Arditi approached enemy trenches while they were being shelled by Italian artillery. Just as the barrage was lifted they would jump inside the trench while the enemy was huddling down, and use their daggers at close quarters to suppress enemy resistance. These primitive tactics were surprisingly effective. Arditi had to hold the positions they conquered for 24 hours and then would be replaced by the regular infantry. Arditi might lose 25% to 30% of their numbers during such an attack. Their motto was O la vittoria, o tutti accoppati meaning "Either victory, or everyone dies". The typical unit had 13 officers and 400 soldiers selected on a voluntary basis. One such unit was completely wiped out while attacking Monte Osvaldo in April 1916. In 1916 the supreme command decided to award special status to Arditi units but was reluctant to create new units. The Arditi badge, to be carried on the left arm, included the monogram VE (for Victor Emmanuel III of Italy), and was designed exclusively as a symbol of distinction for these soldiers. This was the first official use of the word "Ardito" by the Italian army. Following a positive evaluation it was decided to establish the new special units, but disagreements on equipment and training delayed the start of operations until July 29, 1917, when King Victor Emmanuel officially sanctioned the creation of Arditi units. The new assault units were formed and then developed independently with training different from that of ordinary soldiers. The better trained German army was the first to adopt the concept of shock assault troops with the Stormtroopers, but the Italians followed their example. A training school was established, as noted above, at Sdricca di Manzano, in Friuli. The first units were created in the 2nd Army, and by the time of Caporetto there were 27 units, although only a few actually saw combat. In all, approximately 18,000 men made up the Arditi units. Many of these men saw combat on the river Piave, where the advance of Austro-Hungarian troops was halted. Arditi used to swim across the Piave, clenching a dagger between their teeth and assault the Austrian and German positions on the other bank of the river Piave. These men came to be known as Caimani del Piave ("the Caimans of the Piave"). Because Austrian uniforms had a stiff collar, the "Caimani" preferred to use a resolza knife, typical of Sardinia (Pattada), as this blade could easily penetrate the collar of the enemy uniform (other arditi formations used a simple dagger). Today, the badge worn by COMSUBIN commandoes shows a caiman clenching a dagger in its jaws. This is an emblem chosen to honor the memory of the Caimani del Piave. In June 1918 an entire division of assault troops with nine units was placed under the command of Major General Ottavio Zoppi, and then was expanded to become an Army Corps with twelve units in two divisions. 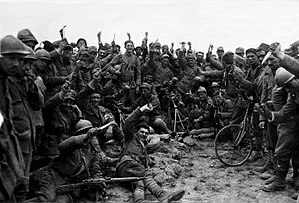 By the end of the war there were 25 assault units, mostly classified as Bersaglieri. In particular, Arditi were trained with hand grenades, marksmanship and the use of the flamethrower and machine gun. Training was very realistic, and several men were killed during basic training: in particular, victims were caused by splinters from hand grenades, because their operating procedure provided for a direct assault immediately after throwing a grenade. The rigorous training, team spirit and contempt of danger, but also the privileges they enjoyed, made the Arditi an elite corps, but also created a climate of distrust and jealousy with officers belonging to other units of the regular army. Their military skill, however, earned them respect for the ability to resolve on the battlefield situations tactically impossible for regular army units. Reginaldo Giuliani, a Catholic priest and an Ardito, wrote several books on his experiences including Croce e spada ("Cross and Sword"). Many of the Arditi badges and symbols were later adopted by the fascist regime, for example a badge depicting a skull with a dagger clenched between the teeth. The anti-fascist Arditi del Popolo also had their own badge (skull with red eyes and dagger). Their battle cry was A Noi! ('to us'), which was later adopted as one of the phrases commonly used when making the Roman salute and originated as a duelling challenge during the Renaissance. Arditi illustrating a fight with dagger and hand grenades. In the post-World War I period, many Arditi joined the 'National Association Arditi d'Italia' (ANAI), founded by captain Mario Carli, then involved in the Futurist movement in art. Carli wrote the essay "Arditi are not gendarmes" in collaboration with Filippo Tommaso Marinetti. Gabriele D'Annunzio (in the middle with the stick) with some legionaries (components of the Arditi's department of the Italian Royal Army) in Fiume in 1919. To the right of D'Annunzio, facing him, Lt. Arturo Avolio. The Arditi were active participants in Gabriele D'Annunzio's coup in the city of Fiume (now Rijeka, in Croatia). When his original plan for Italian annexation was rebuffed by the government in Rome, D'Annunzio proclaimed the founding of the "Italian Regency of Carnaro". 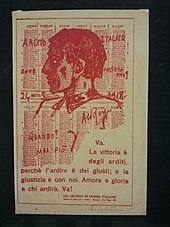 With the trade unionist De Ambris, D'Annunzio promulgated a constitution, the Charter of Carnaro, containing strongly progressive or even radical elements. On December 25, 1920, regular Italian army troops put an end to the short-lived "regency," after brief clashes. Perhaps the most resonant event was the defense of Parma against fascist squadrismo in 1922: around 10,000 squadristi, first under the command of Roberto Farinacci, then Italo Balbo, had to withdraw from the city after five days of clashes against a group consisting of socialists, anarchists and communists, controlled by the heads of the Arditi del Popolo (350 took part in the battle against the fascists) Antonio Cieri and Guido Picelli. The Fascist lost 39 men, the Arditi del Popolo five. Wikimedia Commons has media related to Arditi. Salvante, Martina: Arditi, in: 1914-1918-online. International Encyclopedia of the First World War.